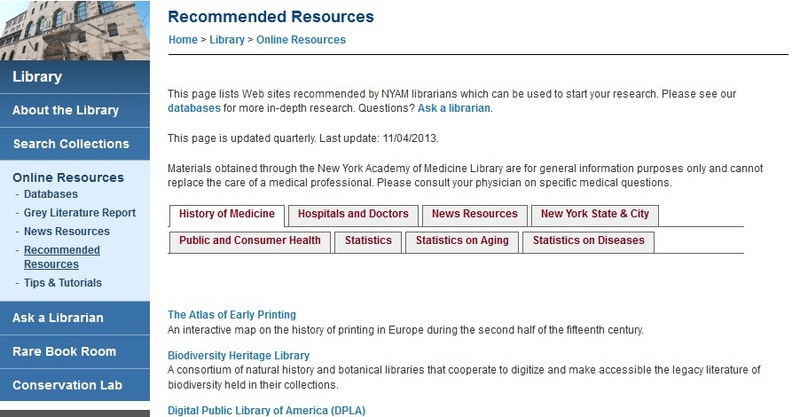 This is part of an occasional series of blogs featuring research tips from NYAM librarians. Are you looking for online sources on public health statistics, consumer health, or the history of medicine? Look no further than our recommended resources list. A screenshot of our Recommended Resources page. The featured resources I use most frequently include the NLM Drug information Portal and Drugs@FDA, listed under the Public and Consumer Health tab, which provide a wealth of information on drugs and supplements. Looking for information on a health care provider? Try the New York State Physician’s Profile (if you are in New York) and the U.S. Department of Health and Human Services’ Hospital Compare, both listed under the Hospitals and Doctors tab. I also often use County Health Ratings and Road Maps from the Robert Wood Johnson Foundation, listed under the Statistics tab. The tool allows you to find public health data at the state or county level, with measures including teen birth rate, adult smoking, and health care costs (among many others). The list also includes sources for statistics on specific diseases (listed under the tab Statistics on Diseases), including the Centers for Disease Control and Prevention’s NCHHSTP Atlas, an interactive tool for accessing HIV/AIDS, viral hepatitis, tuberculosis, chlamydia, gonorrhea, and syphilis data. We update the list quarterly (most recently on November 4, 2013), so make sure to come back to see what’s new. This entry was posted in Collections and tagged health, health information, online research, research tips, websites by nyamhistofmed. Bookmark the permalink.